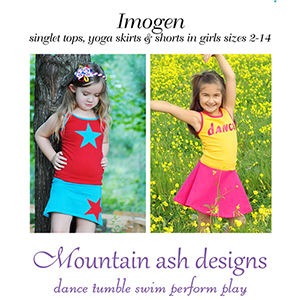 Make your own singlet tops, yoga shorts and skirts using this pdf sewing pattern. For the singlet top there are 2 choices included in the pattern. A classic round neckline at the front and back or a classic neckline at the front and a 'V' neckline at the back. For the skirts there is the choice of a slim fitting A-Line skirt or a full circle skirt. Shorts can either be worn as they are or can be added to the skirt to allow for more modest hanstands and cartwheels. Both the skirts and the shorts have a soft stretchy yoga waistband (no elastic needed!). Suggested fabrics are cotton lycra, brushed poly spandex, lycra spandex, or stretch velvet.